UC Berkeley engineers have shown for the first time that magnetic chips can actually operate at the lowest fundamental energy dissipation theoretically possible under the laws of thermodynamics. That means dramatic reductions in power consumption are possible — down to as little as one-millionth the amount of energy per operation used by transistors in modern computers. The findings were published Mar. 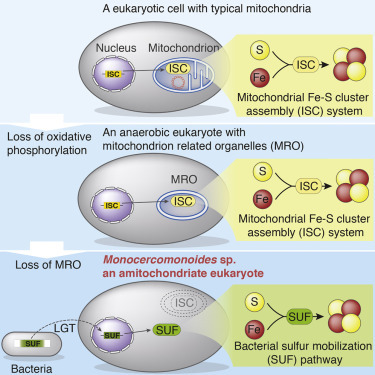 11 an open-access paper in the peer-reviewed journal Science Advances. This is critical at two ends of the size scale: for mobile devices, which demand powerful processors that can run for a day or more on small, lightweight batteries; and on an industrial scale, as computing increasingly moves into “the cloud,” where the electricity demands of the giant cloud data centers are multiplying, collectively taking an increasing share of the country’s — and world’s — electrical grid. “The biggest challenge in designing computers and, in fact, all our electronics today is reducing their energy consumption,” aid senior author Jeffrey Bokor, a UC Berkeley professor of electrical engineering and computer sciences and a faculty scientist at the Lawrence Berkeley National Laboratory. Lowering energy use is a relatively recent shift in focus in chip manufacturing after decades of emphasis on packing greater numbers of increasingly tiny and faster transistors onto chips to keep up with Moore’s law. So researchers have been turning to alternatives to conventional transistors, which currently rely upon the movement of electrons to switch between 0s and 1s. Partly because of electrical resistance, it takes a fair amount of energy to ensure that the signal between the two 0 and 1 states is clear and reliably distinguishable, and this results in excess heat. Nanomagnetic computing: how low can you get? The UC Berkeley team used an innovative technique to measure the tiny amount of energy dissipation that resulted when they flipped a nanomagnetic bit. The researchers used a laser probe to carefully follow the direction that the magnet was pointing as an external magnetic field was used to rotate the magnet from “up” to “down” or vice versa. This is the first time that a practical memory bit could be manipulated and observed under conditions that would allow the Landauer limit to be reached, the authors said. Bokor and his team published a paper in 2011 that said this could theoretically be done, but it had not been demonstrated until now. * The Landauer limit was named after IBM Research Lab’s Rolf Landauer, who in 1961 found that in any computer, each single bit operation must expend an absolute minimum amount of energy. Landauer’s discovery is based on the second law of thermodynamics, which states that as any physical system is transformed, going from a state of higher concentration to lower concentration, it gets increasingly disordered. That loss of order is called entropy, and it comes off as waste heat. Landauer developed a formula to calculate this lowest limit of energy required for a computer operation. The result depends on the temperature of the computer; at room temperature, the limit amounts to about 3 zeptojoules, or one-hundredth the energy given up by a single atom when it emits one photon of light. Minimizing energy dissipation has emerged as the key challenge in continuing to scale the performance of digital computers. The question of whether there exists a fundamental lower limit to the energy required for digital operations is therefore of great interest. A well-known theoretical result put forward by Landauer states that any irreversible single-bit operation on a physical memory element in contact with a heat bath at a temperature Trequires at least kBT ln(2) of heat be dissipated from the memory into the environment, where kB is the Boltzmann constant. We report an experimental investigation of the intrinsic energy loss of an adiabatic single-bit reset operation using nanoscale magnetic memory bits, by far the most ubiquitous digital storage technology in use today. Through sensitive, high-precision magnetometry measurements, we observed that the amount of dissipated energy in this process is consistent (within 2 SDs of experimental uncertainty) with the Landauer limit. This result reinforces the connection between “information thermodynamics” and physical systems and also provides a foundation for the development of practical information processing technologies that approach the fundamental limit of energy dissipation. The significance of the result includes insightful direction for future development of information technology. In 1961, Landauer (1) proposed the principle that logical irreversibility is associated with physical irreversibility and further theorized that the erasure of information is fundamentally a dissipative process. Among several seminal results, his theory states that for any irreversible single-bit operation on a physical memory element in contact with a heat bath at a given temperature, at least kBT ln(2) of heat must be dissipated from the memory into the environment, where kB is the Boltzmann constant and T is temperature (2). The single-bit reset operation process is schematically shown in Fig. 1A. As shown by Landauer (1, 2), the extracted work from the process, regardless of the initial state of the bit, is Woperation ≥ kBT ln(2). This energy, kBT ln(2), corresponds to a value of 2.8 zJ (2.8 × 10−21 J) at 300 K. In the field of ultra-low-energy electronics, computations that approach this energy limit are of considerable practical interest (3). (A) Description of single-bit reset by time sequence. Before the erasure, the memory stores information in state 0 or 1; after the reset, the memory stores information in state 0 in accordance with the unit probability. (B) Timing diagram for the external magnetic fields applied during the restore-to-one process. Hx is applied along the magnetic hard axis to remove the uniaxial anisotropy barrier, whereas Hy is applied along the easy axis to force the magnetization into the 1 state. Illustrations are provided of the magnetization of the nanomagnet at the beginning and end of each stage and of the direction of the applied field in the x–y plane. The first direct experimental test of Landauer’s principle was reported in 2012 using a 2-μm glass bead in water manipulated in a double-well laser trap as a model system (4), and a higher precision measurement using 200-nm fluorescent particles in an electrokinetic feedback trap was recently reported (5). Although the topic is of great importance for information processing, the Landauer limit in single-bit operations has yet to be tested in any other physical system (5, 6), particularly one that is relevant in practical digital devices. Therefore, confirming the generality of Landauer’s principle in another, very different physical system is of great interest. Landauer and Bennett (1, 7) both used nanomagnets as prototypical bistable elements in which the energy efficiency near the fundamental limits was considered. Accordingly, we report here an experimental study of Landauer’s principle directly in nanomagnets. The fact that mesoscopic single-domain magnetic dots comprising more than 104 individual spins can nevertheless behave as a simple system with a single informational degree of freedom has been explicitly analyzed and confirmed theoretically and experimentally (8, 9). Further theoretical studies (10, 11) in which the adiabatic “reset to one” sequence for a nanomagnet memory suggested by Bennett (7) was explicitly simulated using the stochastic Landau-Lifschitz-Gilbert formalism, confirmed Landauer’s limit of energy dissipation of kBT ln(2) with high accuracy. For a nanomagnetic memory bit, magnetic anisotropy is used to create an “easy axis” along which the net magnetization aligns to minimize magnetostatic energy. As shown in Fig. 1A, the magnetization can align either “up” or “down” along the easy axis to represent binary “0” and “1.” We denote the easy axis as the y axis. The orthogonal x axis is referred to as the “hard axis.” The anisotropy of the magnet creates an energy barrier for the magnetization to align along the hard axis, allowing the nanomagnet to retain its state in the presence of thermal noise. To reset a bit stored in the nanomagnet, magnetic fields along both the x and y axes are used. The x axis field is used to lower the energy barrier between the two states, and the y axis field is then used to drive the nanomagnet into the 1 state. In the micromagnetic simulations of Lambson and Madami (10, 11), and as shown in Fig. 1B, the reset sequence can be divided into four steps. Initially, the nanomagnet is in either 0 or 1 state, and afterward, it is reset to the 1 state. The internal energy dissipation in the nanomagnet is found by integrating the area of m–H loops for magnetic fields applied along both the x and y axes (hard and easy axes, respectively) followed by their subtraction. To perform the hysteresis loop measurements of interest, the external magnetic fields are specified as a function of time in a quasistatic manner as illustrated in Fig. 1B. Applying the fields in this manner splits the operation into four stages, and during any given stage, one of the fields is held fixed while the other increased linearly from zero to its maximum value or vice versa, as shown in Fig. 1B. In stage 1, Hx is applied to saturate the hard axis, which removes the energy barrier and ensures that the energy dissipation is independent of the barrier height. As explained by Bennett (7), whether the Landauer erasure operation is classified as reversible or irreversible depends on whether the initial state of the nanomagnet is truly unknown (that is, randomized) or known. However, in both the reversible and irreversible cases, the amount of energy transfer that occurs during the operation is kBT ln(2). The distinction between reversible and irreversible lies in whether or not the operation can be undone by applying the fields depicted in Fig. 1B in reverse. A more complete discussion is contained in Bennett’s work (7). Accordingly, for experimental purposes, there is no need to randomize or otherwise specially prepare the initial state of the nanomagnets to observe the kBT ln(2) limit. This can be further justified by observing that the first stage of the reset operation depicted in Fig. 1B (applying a field along the x axis) is symmetric with respect to the initial orientation of the nanomagnets along the y axis. After the first stage, there is no remaining y axis component of the magnetization of the nanomagnets, so subsequent stages of the operation are independent of the initial orientation of the nanomagnets along the y axis. As a result, the amount of energy dissipated during the Landauer erasure operation does not depend on the initial state of the nanomagnet. Magneto-optic Kerr effect (MOKE) in the longitudinal geometry was used to measure the in-plane magnetic moment, m, of a large array of identical Permalloy nanomagnets, whereas the magnetic field, H, was applied using a two-axis vector electromagnet. The experimental setup is shown in Fig. 2A. The lateral dimensions of the nanomagnets were less than 100 nm to ensure they were of single domain, whereas the spacing between magnets was 400 nm to avoid dipolar interactions between magnets yet provide sufficient MOKE signal. Scanning electron microscopy (SEM) images of the sample are shown in Fig. 2B. 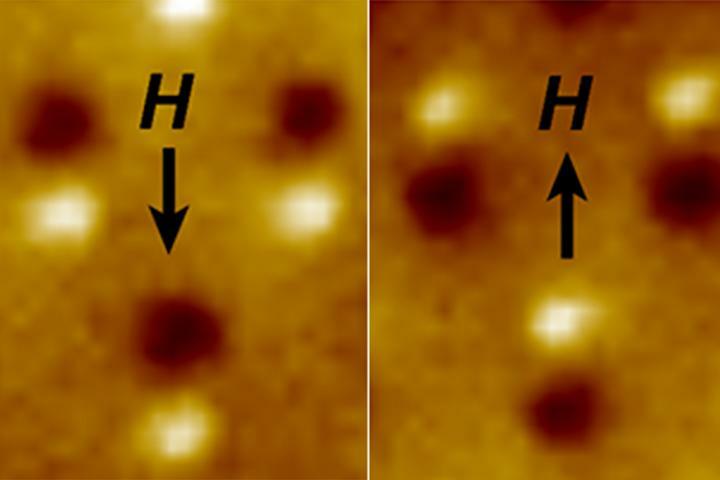 Magnetic force microscopy (MFM) was used to confirm that the nanomagnets have a single-domain structure and have sufficient anisotropy to retain state at room temperature, as shown in Fig. 2C. Longitudinal MOKE is sensitive to magnetization along only one in-plane direction (9), so the sample was mounted on a rotation stage, and separate measurements were made with the sample oriented to measure m along each of the easy and hard axes of the nanomagnets. For each measurement along the two orientations, the magnetic field along the axis of MOKE sensitivity was slowly (time scale of many seconds) ramped between positive and negative values, whereas the transverse magnetic field (perpendicular to the axis of MOKE sensitivity) was held at fixed values. The values of the transverse magnetic field were selected to generate m-H curves corresponding to each of the four steps of the reset protocol shown in Fig. 1B. The comprehensive hysteresis loops during the complete erasure process are illustrated schematically in video S1. Fig. 2The magneto-optic Kerr microscopy experimental set up. (A) Schematic of the experimental MOKE setup. (B) SEM images of the sample. The circle represents the approximate size of the probe laser spot. (C) MFM images of individual single-domain nanomagnets. To quantitatively determine the net energy dissipation during the reset operation from the MOKE data, it is necessary to calibrate both the applied magnetic field and the absolute magnetization of the nanomagnets. The applied field was measured using a three-axis Hall probe sensor. To calibrate the MOKE signal, the total moment, MSVT, for the full sample was measured using a vibrating sample magnetometer (VSM). MS is the saturation magnetization for the full sample and VT is the total volume of the magnetic layer on the sample. An example of experimental results from one run is shown in Fig. 3. The volume of each nanomagnet, V, and the number of nanomagnets on the substrate were measured and calibrated using SEM for the lateral dimensions and count, and atomic force microscopy (AFM) was used to determine the thickness (see the Supplementary Materials for details). In this way, the MSV value for an individual nanomagnet from the MOKE data could be absolutely determined. Researchers have shown, mathematically, that many different kinds of disturbances evolve to produce wave forms belonging to a single class, denoted by their identical asymptotic state. BUFFALO, NY — One of the great joys in mathematics is the ability to use it to describe phenomena seen in the physical world, says University at Buffalo mathematician Gino Biondini. With UB postdoctoral researcher Dionyssios Mantzavinos, Biondini has published a new paper that advances the art — or shall we say, the math — of describing a wave. The findings, published January 27, 2016, in Physical Review Letters, are thought to apply to wave forms ranging from light waves in optical fibers to water waves in the sea. The study explores what happens when a regular wave pattern has small irregularities, a question that scientists have been trying to answer for the last 50 years. Researchers have long known that, in many cases, such minor imperfections grow and eventually completely distort the original wave as it travels over long distances, a phenomenon known as “modulational instability.” But the UB team has added to this story by showing, mathematically, that many different kinds of disturbances evolve to produce wave forms belonging to a single class, denoted by their identical asymptotic state. He says the first great success in using math to represent waves came in the 1700s. The so-called wave equation, used to describe the propagation of waves such as light, sound and water waves, was discovered by Jean le Rond d’Alembert in the middle of that century. But the model has limitations. Over the next 250 years, scientists and mathematicians continued to develop new and better ways to describe waves. One of the models that researchers derived in the middle of the 20th century is the nonlinear Schrödinger equation, which helps to characterize wave trains in a variety of physical contexts, including in nonlinear optics and in deep water. But many questions remained unanswered, including what happens when a wave has small imperfections at its origin. This is the topic of Biondini and Mantzavinos’ new paper. The next step, Biondini said, is to partner with experimental researchers to see if the theoretical findings hold when applied to tangible, physical waves. He has started to collaborate with research groups in optics as well as water waves, and he hopes that it will soon be possible to test the theoretical predictions with real experiments.